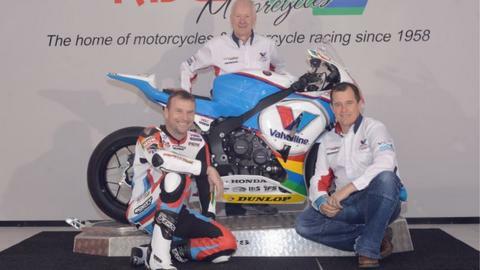 Bruce Anstey aims to take his number of North West 200 wins to 10 when he races on his Padgett's Honda next month. The 44-year-old New Zealand rider has secured a podium finish at the North West, TT and Ulster GP every year for the last 11 seasons. "I won as a newcomer at the North West back in 2002 and I have always loved coming back," he said. "The Honda won't be the fastest bike out there in the Superbike class but we will be in there." Anstey will ride a full line-up of Hondas at the North West while John McGuinness will race on Padgett's prepared Superstock and Supersport Hondas alongside his factory Superbike. "Racing there is all about getting into the right place at the right time and not getting caught out on the coast road. You have to stay really switched on," Anstey added. "Alastair Seeley will be hard to beat as usual and there are loads of other people who are capable of winning. "The weather has made things difficult the last few years but I don't mind the rain. It kinda evens everything out a bit."